Create a signature hanging fixture in your home through the wondrous options offered in the Princeton collection. The frames are highlighted with a rainbow of finishes coloring the etched-glass center column and bobéches, as well as the graceful glass-covered arms. Select from Chrome Finish, Gold Finish, Purple Finish, or Red Finish. Beneath the candelabra lights (not included) are draped strands of octagon crystals, with a single crystal ball finishing off this elegant showpiece. 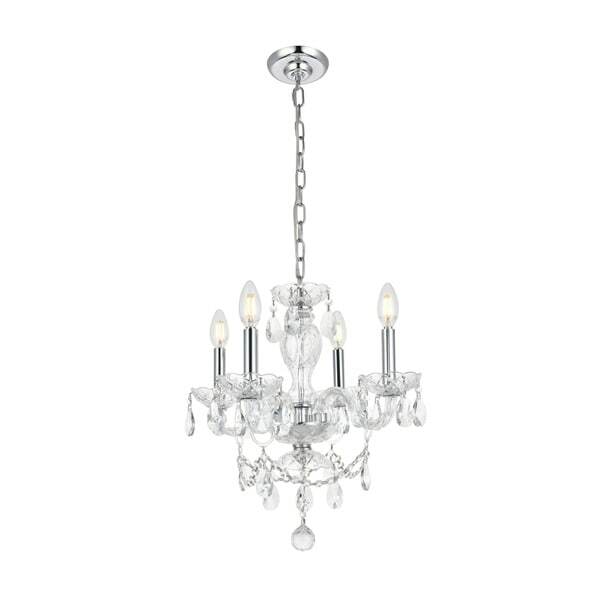 The Princeton collection encourages you to use your imagination to customize a chandelier or pendant lamp that reflects your decorating style in your living room, dining room, bedroom, bathroom, or foyer. This Princeton Collection 4-Light Pendant with Royal Cut Crystals has a diameter of 17 inches and a height of 18 inches. Dimensions 17.0 In. X 18.0 In.